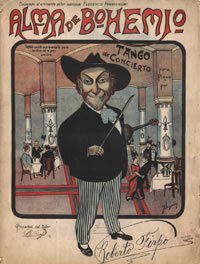 Alma de Bohemio, written by Roberto Firpo in 1914, was considered in it’s time as a “concert tango” since it was first performed in a play by the same name. It became the self-professed trademark song of Alberto Podesta. He recorded it several times, but the most common version heard in milongas is with the orchestra of Pedro Laurenz. Podesta sang with other major orchestras of the golden age. Already as a teenager he was recording with Miguel Calo, and at eighteen years of age was stolen away by Carlos Di Sari. The above recording of Alma de Bohemia was made at the age of nineteen. But back to Alma de Bohemio, it is always interesting to see how dancers express Podesta’s famous high notes. Maybe some day there should be a lesson in a workshop on that.